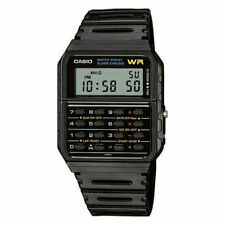 Casio Retro Databank Digital LCD Watch with Calculator etc. - Model Ref. Stopwatch function - 1/100 sec. Proper retro and super cool. Features an 8-digit calculator that can add, subtract, multiply and divide. Black 10 Year Battery Casual Classic Watch with a black resin band and silver case. Muli-function Alarm with Snooze. 12/24 Hour Formats. Accuracy: /-30 seconds per month. battery life: 10 years. LED Light with Afterglow. The classic G Shock ABC watch. Shock Resistance. The watch has been worn twice, in minty condition, as the pictures will show. Shock Resist. 12/24 Hour display switching. ±15 seconds per month. Power Saving Mode : Approx 23 months. Casio Collection W-86-1VQES Mens Digital LCD Watch. 4.5 out of 5 stars - Casio Collection W-86-1VQES Mens Digital LCD Watch. 26 product ratings26 product ratings - Casio Collection W-86-1VQES Mens Digital LCD Watch. Stopwatch function - 1/100 sec. Long life battery fitted. The button tones for using the mode button can be turned off. Daily alarm. Radio signal receiver (EU, USA, Japan). Safety Catch. Once set, the automatic calendar always displays the correct date. Extra long battery life. Weighs only 30 grams - A superb watch from Casio! Facelight with Neolight after light. Button tones on/off The button tones for using the mode button can be turned off. RRP: £130.00. You will have a huge range of watches to choose from and a variety that is unparalleled in the market. POCKET WATCH. Special Feature: Solar Power. Head Depth (mm): 16. Watches2U have now been in operation for over 15 years and have a wide range of different great value products. 1 x Casio B640W. Black Strap. Digital display. Black face. 50.4 mm resin case with mineral dial window. Resin band with buckle closure. Argos will then notify you when your order is ready for collection. 10 Year battery - CR2025. Black dial. Easy to read dial. Watch features Self adjustable links. Face width 45mm. Stainless steel case. 1/100-Second Stopwatch. Chronograph Function. Daily alarm feature plus auto-calendar, up to 7 year battery. Battery can be changed easily and cheaply too! Water resistant to 50m (165ft: in general, suitable for short periods of recreational swimming, but not diving or snorkeling. ). Black resin strap. Resin case. The watch is 10ATM. No user manual/Operation Guide is supplied but it can be downloaded from manufacturer's website. See sample pictures (apart from the first four pictures) to see the watch condition. 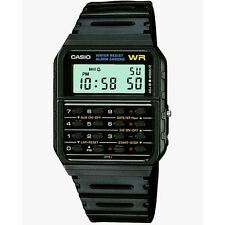 For sale, one superb, near mint condition Casio Pro-Trek PRW-2500-1ER, multi band-6 atomic, solar powered, duplex LCD, ABC wristwatch, owned from new, but rarely worn - still thinning out my watch collection! CASIO G-SHOCK DUAL DISPLAY WATCH. Black resin band with buckle fastening. White resin case. Digital Display. 200m Water Resistance (20 atmospheres). Stopwatch and alarm functions. 12 or 24 hour display options. Stopwatch function - 1/100 sec. A light-emitting diode (LED) is used to illuminate the watch face in low light. Extra long life battery already fitted which is easily and cost effectively replaced. A top quality product from much trusted Casio! Stopwatch function - 1/100 sec. Long life battery fitted. Automatic calendar with year, month and date. The button tones for using the mode button can be turned off. Bought in Feb to give to daughter for 18th. STRAP TYPE Resin. CASE MATERIAL Resin. CLASP TYPE Buckle. Shock Resistant: Shock Resistant construction protects againt impact and vibration. STRAP COLOUR Black. 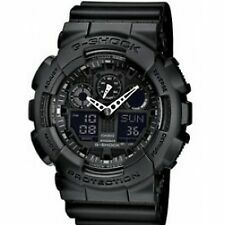 Strong styling combines with basic dark colours in the best G-Shock tradition of stylish toughness. 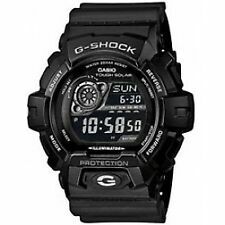 5 out of 5 stars - Casio G-Shock Mens Black Combi Resin Strap Watch G-100-1BVMUR. 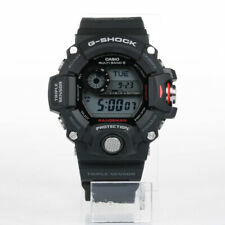 10 product ratings10 product ratings - Casio G-Shock Mens Black Combi Resin Strap Watch G-100-1BVMUR. Stopwatch and alarm functions. 12 or 24 hour display options. Stopwatch function - 1/100 sec. - 24 hours. Daily alarm. A light-emitting diode (LED) is used to illuminate the watch face in low light. Smart colour and design. Stopwatch function - 1/100 sec. 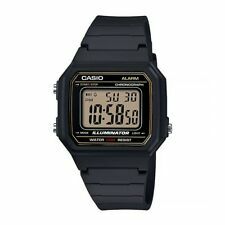 Original and Genuine Casio Watch supplied with Presentation Box and Full 2 Year Manufacturers Warranty. Daily alarm. Easy to read display even in low light situations - A built-in light illuminates watch face from side. 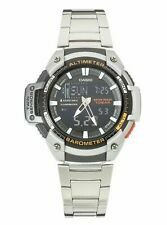 Casio Wave Ceptor Radio Controlled Digital Mens Wrist Watch WVA-M640D-2AER. Stainless steel strap. Extra links and adjustment tool included. Still within warranty period. Bought for USA trip. Amazing to see watch adjust automatically for time zones. Just received an upgrade for birthday. Great condition and all paperwork included. Happy bidding. Ps Watch is Solar powered. No battery replacement ever.Very good condition. Camouflage Edition. Shock Resistant. We take a serious view of our job and this is the reason that we take photos of each model at different angles so you can achieve a maximum idea of that you are interested in. Casio W800H-1AV. 12/24 hour format. Men's CASIO 4335 AQF-100 Thermometer, Tide Graph & Moon Phase. In good condition and working. New battery fitted. Small fitting. Casio Ladies' Silver Tone Digital Watch. 4.5 out of 5 stars - Casio Ladies' Silver Tone Digital Watch. 5 product ratings5 product ratings - Casio Ladies' Silver Tone Digital Watch. 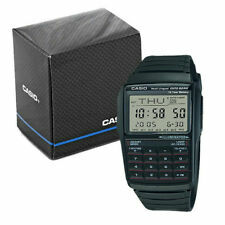 Original and Genuine Casio Watch supplied with Presentation Box and Full 2 Year Manufacturers Warranty. Smart colour and design. Easy to read display even in low light situations - A built-in light illuminates watch face from side. Casio Classic Mens Digital Watch W 86 1 VQES. Condition is Used. Dispatched with Royal Mail 2nd Class. Display Type﻿ analogue - digital. Band Material resin. Clasp Type﻿ Buckle. Case Material resin. Band Colour black. Dial Window Material Type﻿ Plastic. Water Pressure Resistance 5 bar. We will do our utmost to resolve any issues. RRP: £105.00. You will have a huge range of watches to choose from and a variety that is unparalleled in the market. POCKET WATCH. Band Length (cm): 23. Head Depth (mm): 18. Strap Colour: Red. Watches2U have now been in operation for over 15 years and have a wide range of different great value products. No user manual/Operation Guide is supplied but it can be downloaded from manufacturer's website. Black dial. Buckle clasp. Black resin strap. See above for further functions. Clasp: Buckle. Strap Width: 20mm. Strap Colour: Black. Strap Material: Plastic. Strap Type: Strap. Dial Colour: Black. 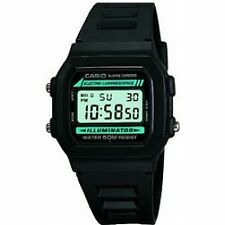 Casio CA-53W-1Z Calculator Watch 100% Genuine New With Original Case!! Casio G-Shock MRG-130T RARE Model Titanium Wrist Watch from 1990s "JAPAN"
Enjoy your fitness routine with a casio sports watch with a backlight. These watches are lightweight and often measure distance, so cyclists and runners can track their times. Typically shock-resistant, they will be unaffected by unintended impacts. With digital displays, they are a fantastic choice for those who are always on-the-go. 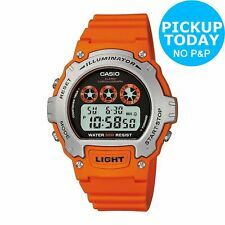 These casio watches also have a backlight, which will illuminate the display so that you can see the time in low light conditions. Solid gold bands are resistant to corrosion, so these casio watches will look like new for years to come. Entirely made of gold, the bands are highly precious and beautiful. Polyurethane band watches have lightweight builds, which make them even more comfortable to wear for any activity. Featuring soft designs, they are pleasant to wear and won't distract you throughout your day. Hand-wound mechanical wristwatches are a great choice for anyone who enjoys the motion of manually winding their timepiece. They tend to have thinner profiles for a sleeker appearance. Automatic quartz movement wristwatches tick with the help of a small crystal that vibrates to spin the hands. The movements are renowned for their accuracy and precision, making these watches exceptionally reliable. 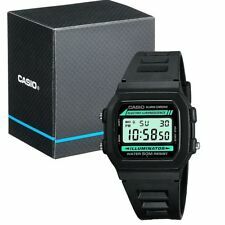 Which casio sports watches with backlights are the most popular among ebay shoppers?